Vintage Danish Modern Art Pottery Soholm Horse Wall plaque. Piece is in lovely condition. 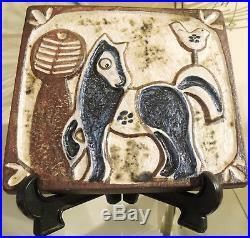 The stoneware wall plaque depicts a pony or horse and is signed to the back with the Solholm, Bornholm stamp. 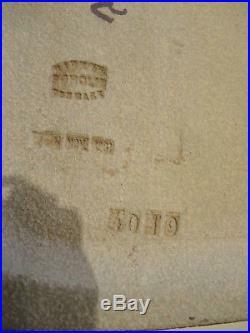 The piece is also stamped 1981. 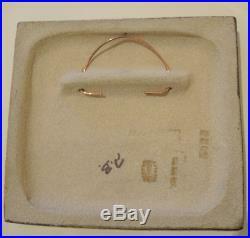 There is a copper hanger attached or it can be displayed on a plate stand as we have. There is no damage to this piece. The plaque is 220mm x 185mm and around 20mm thick. For Imperial measurement users a handy guide is 25mm. Or 2.5cm is a little less than 1 inch, so 100mm or 10cm is just less than 4 inches. Please note this item is original and not a copy or modern day reproduction. We do not mark merchandise values below value or mark items as "gifts" - US and International government regulations prohibit such behaviour. The item "Vintage Danish Art Pottery Soholm Horse wall plaque" is in sale since Friday, October 27, 2017. This item is in the category "Pottery, Glass\Pottery, Porcelain\Figurines".